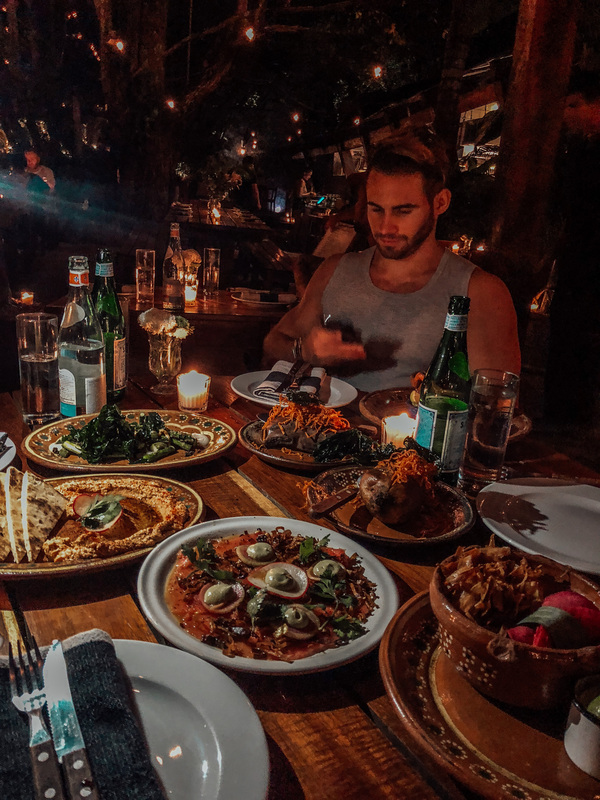 After having been to Tulum two times and having sampled my way through all kinds of different restaurants, bars and healthy places I feel like I simply need to share my favorite food spots with you. 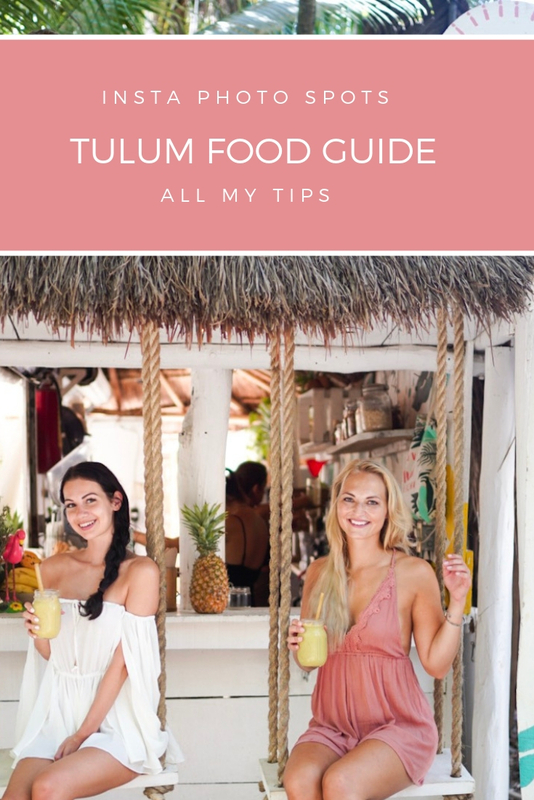 Here you find a Tulum restaurant guide so you can have the best experience possible in this wonderful town! 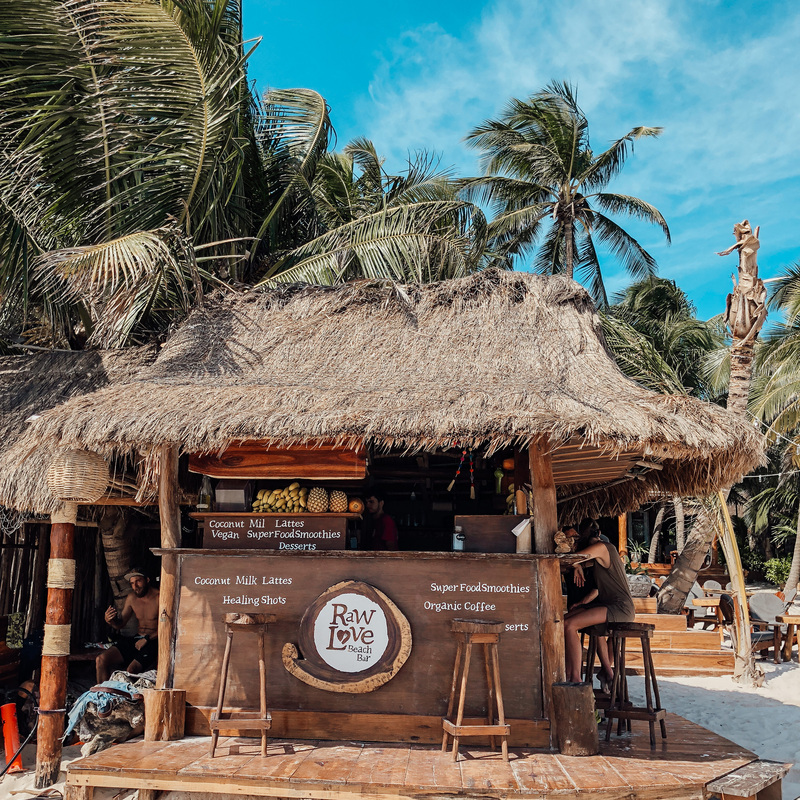 Tulum just has this incredible vibe you have to experience for yourself. Everything in Tulum is so artsy and unique. 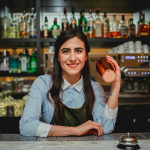 All the hotels, restaurants and bars kind of follow the same style guide. You will find a lot of wood, candles and palm leaf roofs. 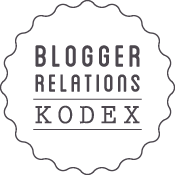 Some hotels adapt a digital detox concept and don’t have wifi or electricity. 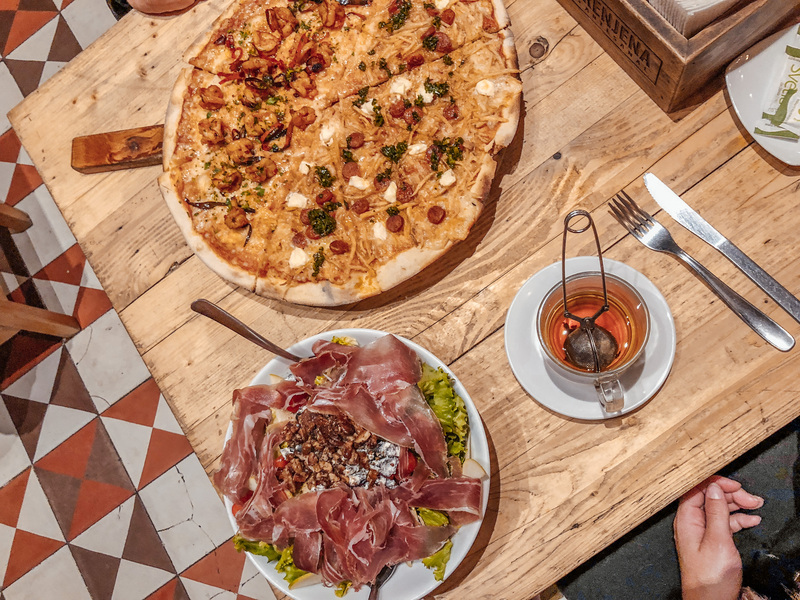 They have a concept of creating true sustainability, thats why they take care of all the details from the materials of the constructions to the ingredients of the food prepared in the restaurants. Tulum is a unique place and much different than any other part of Mexico. Forget the posh and shiny hotel resorts you find in Cancun and expect a more down to earth, eco nature vibe. This is also reflected by the cuisine you find there. 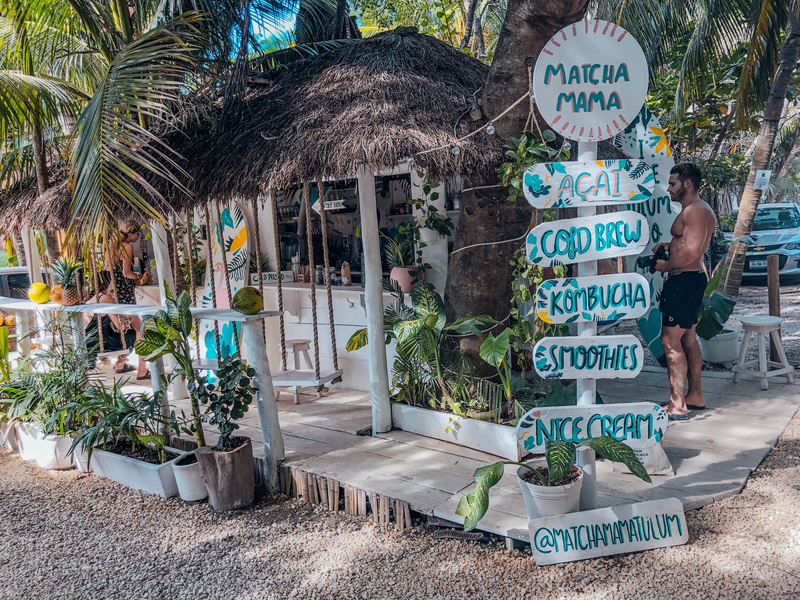 Tulum is packed with raw and vegan cafes and fancy designer food. 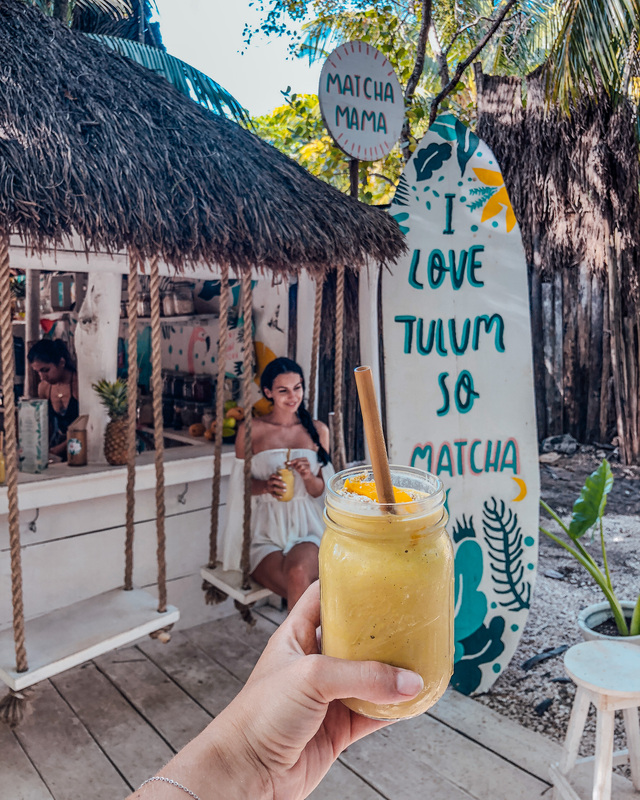 I had so much fun eating and sampling my way through the food places and will tell you about my favorite spots in my Tulum restaurant guide now. Raw love is a super cute beach bar that will make your heart beat faster if you are even remotely interested in nice cream bowls. 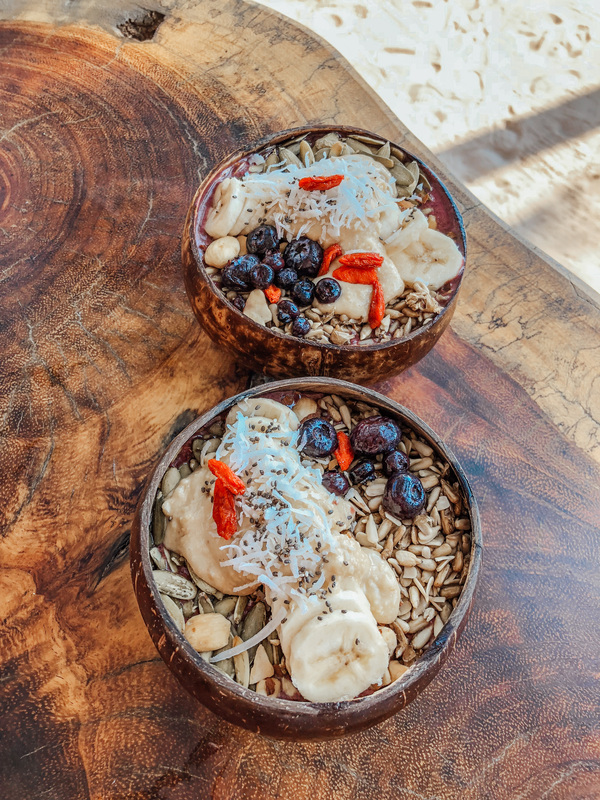 I had to include Raw love in my Tulum restaurant guide for its incredible selection of superfood bowls that will convert any non vegan into a nice cream lover. 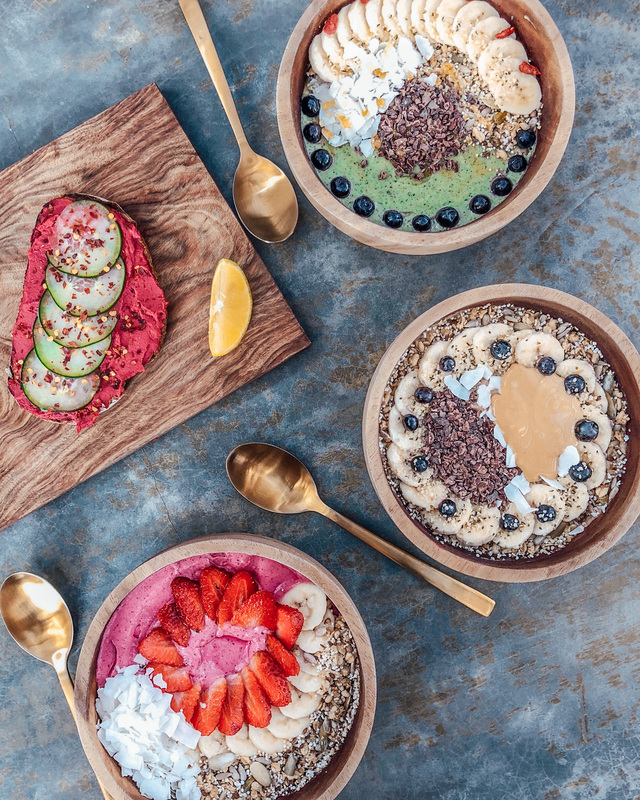 They are served beautifully in coconut bowls and you can even add protein (vanilla, chocolate or hemp) to any of the yummy treats. Enjoy the bowls right by the beach and crystal clear blue water. They also have the option of turning your bowl into a smoothie for take away. What I loved is the idea of their Pharmacy shots, which are super high dosed superfood shots. Pure life elixir for your body. The drink menu is quite extensive and you can decide if you want either a smoothie or a bowl. I had the Mamacita smoothie which included matcha, almond milk, banana, mango and peanut butter. The smoothies are for Mexican standards pretty expensive, but definitely worth it! A smoothie is around 150 pesos (7$) and the bowls 200 pesos (10$). A definite highlight on my Tulum restaurant guide. 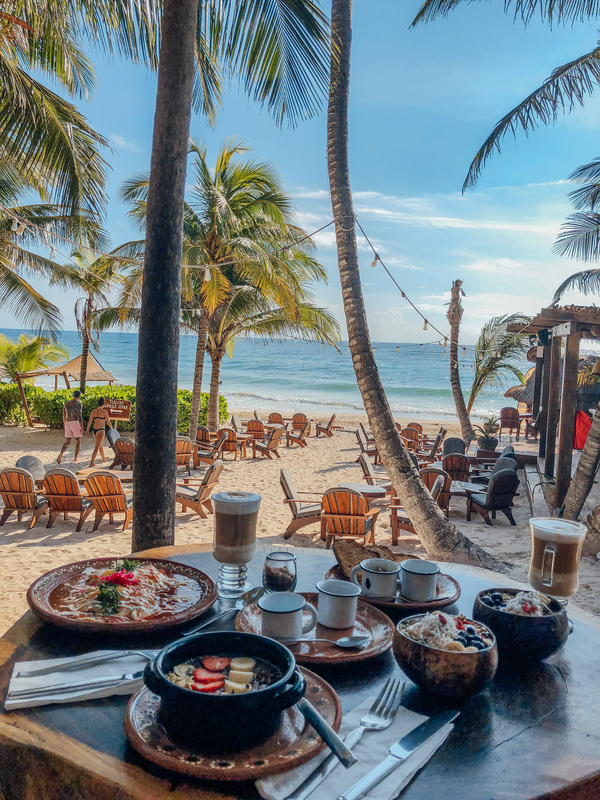 Ahau is a hotel with a beach club and restaurant on the main hotel street in Tulum. After a morning workout in the jungle gym which is very close, we headed over to Ahau for breakfast. 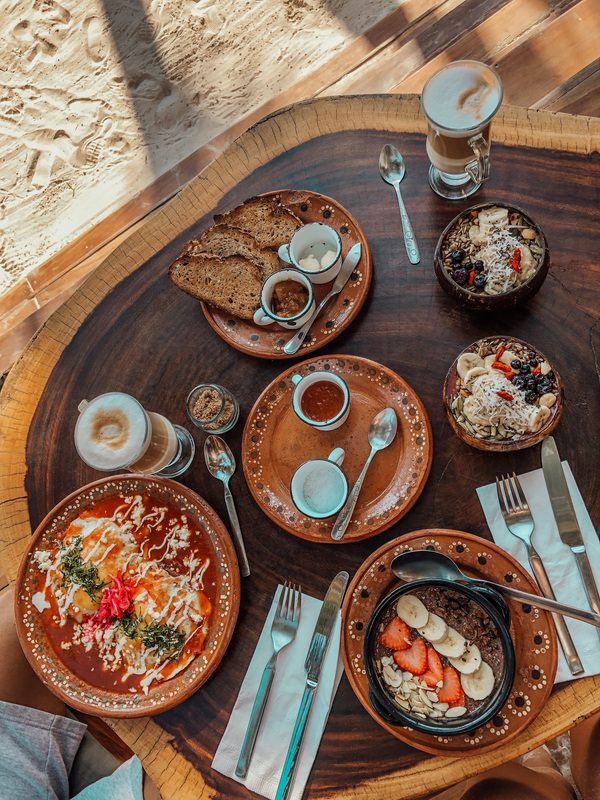 They have a generous menu of different breakfast choices ranging from Mexican to super healthy vegan food. 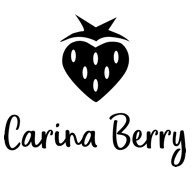 I ordered the chocolate chia pudding in coconut milk with strawberries, banana, roasted almonds and cacao nibs. Alberto got the huevos rancheros, which is a very traditional Mexican breakfast dish and sooo delicious. They atmosphere is so chill and you have a direct view onto the beach. Certainly, my favorite breakfast location of this trip. This place is another world and on top of my Tulum restaurant guide list. I don’t think I have ever been to a more beautiful restaurant. We went for dinner and there were little lanterns, lights and candles everywhere. The atmosphere, style and setting was simply breath taking. The food was one of the best I had in Mexico and the waiters super nice. My Mexican room mate recommended me Gitano and we actually already wanted to go last year, but then a huge rain shower came and we stayed at home. So happy we went this time. They have such healthy options on the menu. We had sweet potato, hummus, asparagus, tuna carpaccio and pulled beef tacos. It’s not cheap for Mexican standards, but still absolutely affordable for us Europeans. 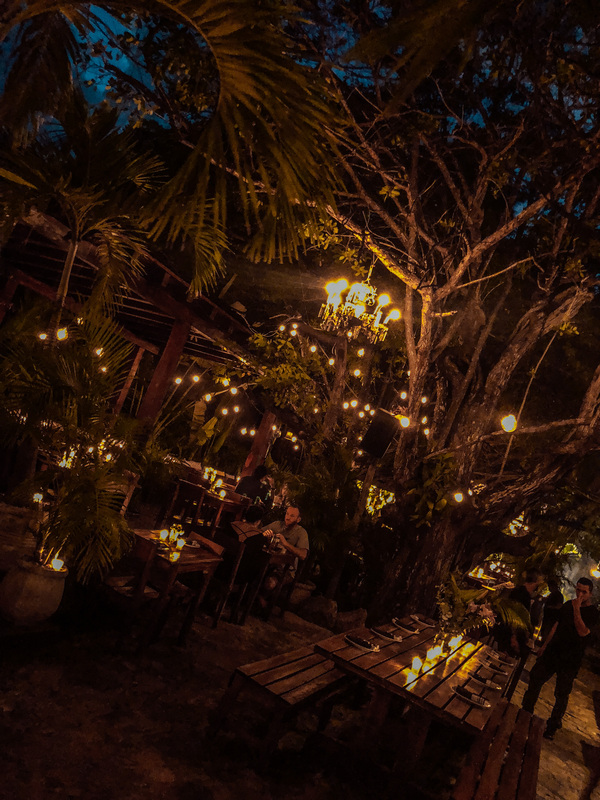 In Avenida Tulum you find the super cute Burrito Amor restaurant. It has a super laid back and chill atmosphere. We went there for lunch. The boys ordered burritos and us girls had a smoothie and a salad. Honestly I would not recommend the salad – it was super sour and small, but everything else was really good. 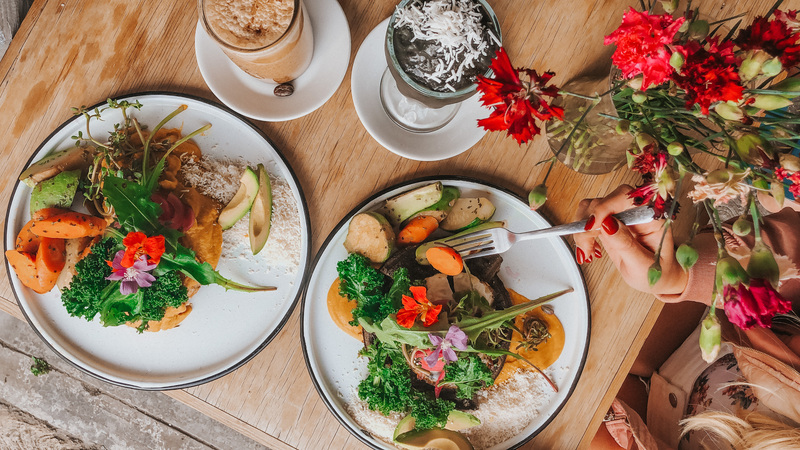 The owners of Burrito Amor introduced a clean eating concept and thats why you will find a lot of healthy options on the menu. It is a great place if you are in or out of the city to grab a quick snack. Portions aren’t super big, but the atmosphere definitely has its charms and the vanilla bread is the best sweet bread I have ever tried. 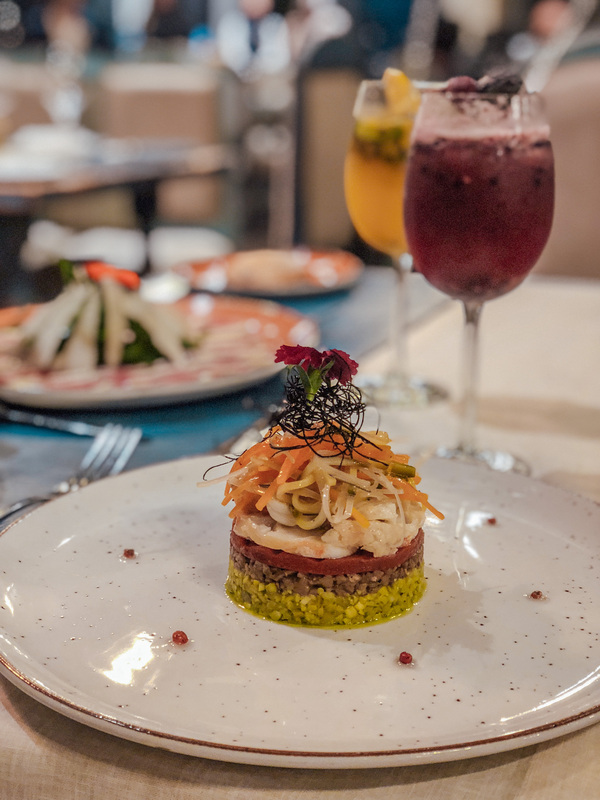 NÜ’s goal is to make you discover the richness of the modern Mexican cuisine through flavorful and original recipes. We only walked by it several times and I admired its simplistic setting. 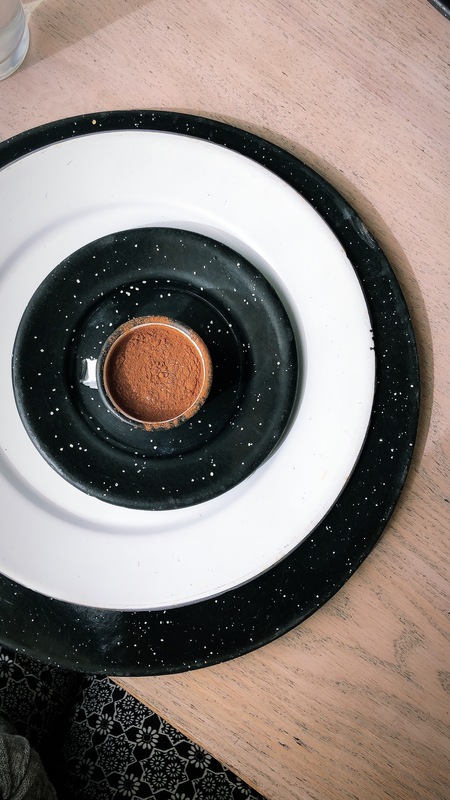 It is quite pricy, but the dishes on their Insta and Homepage look super exquisit. 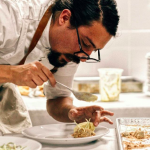 NÜ is run by 7 talented Chefs and this restaurant was on top of my list. Unfortunately, not enough time to try them all. Therefore, I would highly recommend you going there and tell me if the food really was as delicious as I imagined it to be. Since we didn’t go there I also unfortunately don’t have a photo of this place. 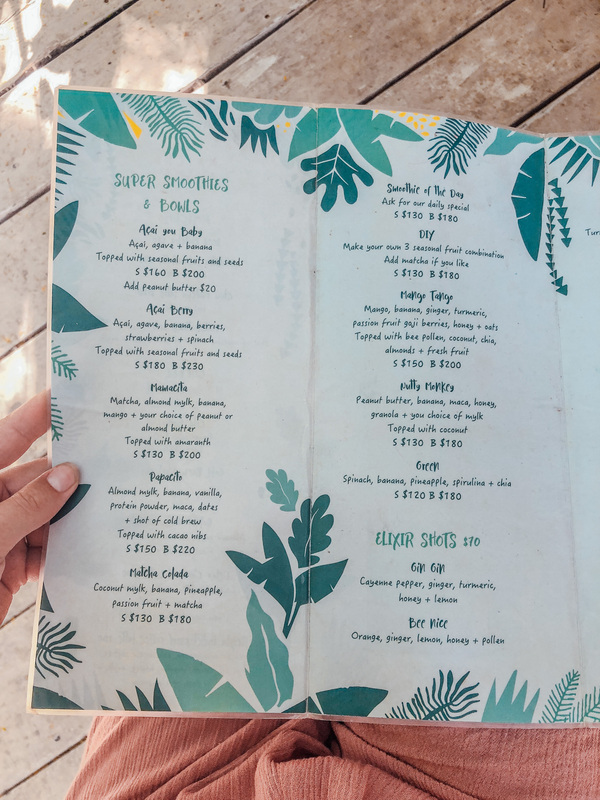 I hope you enjoyed this blog post and if you ever go and visit you might find this Tulum restaurant guide helpful. If I had to choose one place out of all the ones I mentioned about I would strongly urge you to go and have dinner at Gitano. It is one of the most magical restaurants I have ever been to. Regarding the best photo spots you need to take a picture at Matcha Mama on the cute swings. 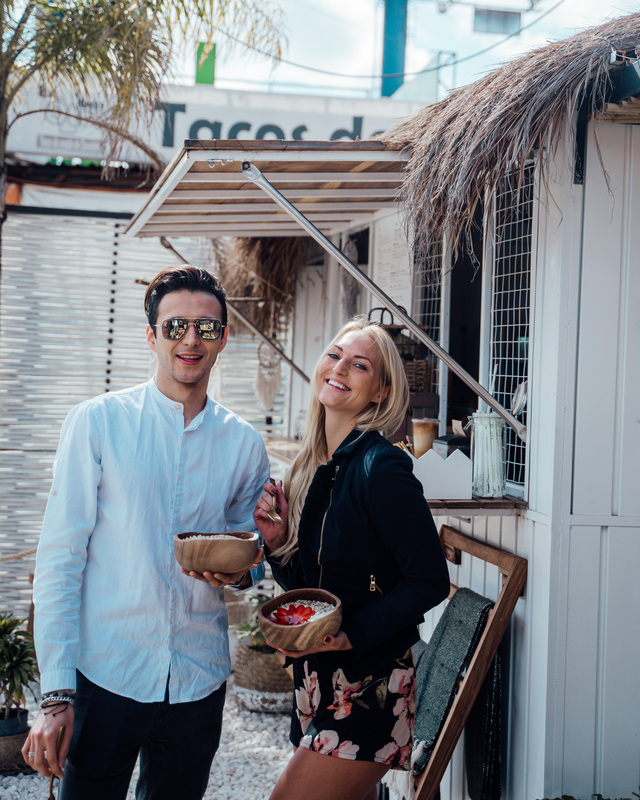 When you walk up that same street a bit in the direction of Tulum downtown you will find a sign that says „Follow that dream“ which is also perfect for photos. 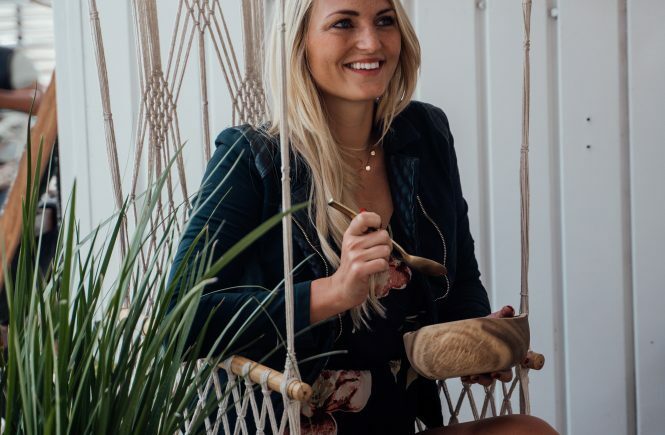 Besides that any of the stylish hotels offer plenty of photo spots (Be Tulum, Azulik, the Nest) and the Jungle Gym is also a great opportunity to get some workout photos. Make sure to also check the blog post on the Riviera Maya photo spots and travel places sharing my entire travel route.